The indicator lamp in the button (arrow) lights up when the function is switched on. When switched on, the Auto Hold function automatically prevents the vehicle from rolling away without having to depress the foot brake. The Auto Hold function holds the vehicle as soon as it detects that the vehicle is not moving and the brake pedal is released. The green indicator lamp in the instrument cluster display showing that the vehicle is being held on the electric parking brake will light up. 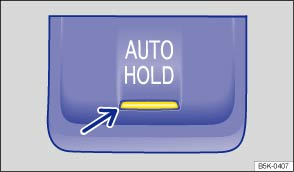 When the driver pulls away, the Auto Hold function releases the electronic parking brake again. The green indicator lamp in the instrument cluster display will go out again and the vehicle will start to move in accordance with the incline of the road. The driver is wearing a seat belt. If any of the conditions for the Auto Hold function change while the vehicle is stationary, the Auto Hold function will switch off automatically and the green indicator lamp in the instrument cluster display will go out, along with the yellow indicator lamp in the button. The electronic parking brake may close automatically to park the vehicle securely . Press the button . The indicator lamp in the button (arrow) goes out when the Auto Hold function is switched off. If the Auto Hold function has been switched on using the button before switching the ignition off, the Auto Hold function switches on automatically when the ignition is switched on the next time. The same applies if the Auto Hold function is switched off – it will remain switched off when the ignition is switched on again. The intelligent technology in the Auto Hold cannot change the laws of physics. Never let the extra convenience afforded by the Auto Hold function tempt you into taking risks when driving. Never leave the vehicle if the engine is running and the Auto Hold function is switched on. Auto Hold cannot hold the vehicle in all hill start situations (e.g. if the ground is slippery or icy). Before driving into a car wash, you should always switch off the Auto Hold function as damage could be caused if the electronic parking brake is closed automatically.